We’d love your help. Let us know what’s wrong with this preview of The Man Who Would Be King by Ben Macintyre. The true story of Josiah Harlan, a Pennsylvania Quaker and the first American ever to enter Afghanistan, has never been told before. Soldier, spy, doctor, naturalist, traveler and writer, Josiah Harlan wanted to be a king, with all the imperialist hubris of his times. In an amazing twenty-year journey around Central Asia, he was variously employed as surgeon to the Maharaja of Punjab, revolutionary agent for the exiled Afghan King, and then commander-in-chief of the Afghan armies. In 1838, he set off in the footsteps of Alexander the Great across the Hindu Kush and forged his own kingdom, only to be ejected from Afghanistan a few months later by the invading British. To ask other readers questions about The Man Who Would Be King, please sign up. Who knew that Kipling's famous tale was loosely based on the exploits of an American adventurer? I sure didn't, but was fascinated by this literary predecessor. MacIntyre's colorful biography traces the rise of one Josiah Harlan, a lapsed Quaker from Chester County, Pennsylvania, whose nominally harebrained schemes to pursue glory in remote regions beyond the Indian frontier eventually led to his becoming a key adviser to the ruler of Afghanistan and commander of his army. His crowning achievement was being proclaimed the "Prince of Ghoree" in the remote mountains of Hazarajat, a short-lived triumph before his ultimate flight from Afghanistan a few months later in the wake of a British-led invasion. As MacIntyre makes clear, Harlan in many ways was an eccentric figure, at times bordering on ridiculous, but he was at the same time brave, determined, wily, and intelligent. He had a peculiar capacity to reconcile drastically different philosophies, most notably American ideas of freedom and justice and a romanticized view of benevolent monarchy. Harlan's initial impetus for traveling to Afghanistan, too, was romantic: jilted by his fiancee, he joins the British Army in India in the capacity of (self-taught) surgeon. After meeting the exiled Afghan king Shujah al-Mulk in a northern frontier town, Harlan, who habitually "made no small plans" concocted a scheme to travel to Kabul and restore the king to his throne. From that point on, Harlan seems less buffoonish, as he masters languages and customs with ease, gaining insight into the convoluted shifting Afghan tribal alliances not to mention the "Great Game" unfolding in some of the remotest places on earth. Reading of Harlan's encounters with Afghan chieftains and his many near-brushes (and occasional outright) disasters shed no little light on how, in some ways, the region still operates today. MacIntyre used Harlan's own voluminous writings as well as those of other travelers to the region to flesh out a fascinating world, and it's easy to understand why Harlan, who initially felt disdain for the "primitive" people of the region, ultimately became assimilated and ultimately switched alliances altogether - standing with the king he once set out to depose and against the British-backed one he initially wanted to restore. In the end, I found my initial appraisal of this somewhat quixotic figure had turned to admiration. Harlan, who continually imagined himself following in the footsteps of Alexander, had something of that legendary conqueror's daring and no small measure of his ability to lead men. MacIntyre's quest in writing the book, too, seems to have been an undertaking of no little scope: intrigued by scattered references he ran across about Harlan, he managed to track down his papers in a forgotten Chester County archive. Yet MacIntyre refrains from using the story of his quest as a major theme, which I found admirable as I've been bored on more than one occasion by writers so puffed up with their own research feats that they can't help but insert themselves into the tale. Here instead MacIntyre merely sets the book into motion with his initial fascination, while the atmosphere throughout is testimony to his extensive travels in pursuit of the elusive Harlan. The True Story of The Man who would be King, says the subtitle to my edition; the qualification is important, for without it the reader might regard this as a wonderful piece of picaresque fiction. Josiah Harland is seen as the inspiration for Rudyard Kipling's Kim, though with a back story that might have been found in Mark Twain. Having set out from Pennsylvania in November 1827 to visit the dark areas of central Asia, Josiah learns he has been dumped by his fiancée and decides to stay on. Twen The True Story of The Man who would be King, says the subtitle to my edition; the qualification is important, for without it the reader might regard this as a wonderful piece of picaresque fiction. Josiah Harland is seen as the inspiration for Rudyard Kipling's Kim, though with a back story that might have been found in Mark Twain. Having set out from Pennsylvania in November 1827 to visit the dark areas of central Asia, Josiah learns he has been dumped by his fiancée and decides to stay on. Twenty years and a series of extraordinary escapades later - including the acquisition of his own kingdom - he returns to the United States more or less broke but undaunted. His proposal to develop camel transport as preferable to the burgeoning railway is unsurprisingly unsuccessful; his treatise proposing the importation of the grape-vine from Cabul to central USA actually reached Congress in 1862 but fell upon unfertile ground. I was not very impressed with the writing style of the author, but Josiah Harlan was absolutely amazing! I loved the Michael Caine and Sean Connery movie, The Man Who Would Be King, that came out when I was in high school. The John Huston film was nominated for four Academy Awards. Christopher Plummer played the role of a young journalist by the name of Rudyard Kipling - and the film was based on the Kipling's short story by the same name. But who knew that Kipling's literary bon mot was inspired by a true story - and that truth truly is stranger than fiction? In 1989, Ben Macintyre was sent to Afgha I loved the Michael Caine and Sean Connery movie, The Man Who Would Be King, that came out when I was in high school. The John Huston film was nominated for four Academy Awards. Christopher Plummer played the role of a young journalist by the name of Rudyard Kipling - and the film was based on the Kipling's short story by the same name. In 1989, Ben Macintyre was sent to Afghanistan to cover the final stages of the 10 year war between the Soviets and the CIA-backed Mujahideen guerrillas. While there he read Kipling's tale of Daniel Dravot (written in 1888 but looking back to the middle of the Victorian Age, the 1820s and 30s), who made it to the heart of Afghanistan disguised as a Muslim holy man to become king of a fierce tribal empire. It was several years later, while combing through stacks of books in the British Library that Macintyre first discovered the name of a man who "reputedly inspired Rudyard Kipling's story, 'The Man Who Would Be King.'" So began Macintyre's search for an elusive footnote in history - all his papers were assumed to have been destroyed in a house fire in 1929 - that culminated in The Man Who Would Be King, a fascinating slice of history that is relevant to today's most pressing geopolitical hotspot. Following clues that led him from Britain's war archives to the Punjab, San Francisco, and Pennsylvania, Macintyre was finally able to find a box hidden away in the basement of the archives in a tiny U.S. museum of this mysterious man's birthplace. At the bottom of the box was a "document, written in Persian and stamped with an intricately beautiful oval seal: a treaty, 170 years old, forged between an Afghan prince and the man who would be king." The first American in Afghanistan had many titles: Prince of Ghor, Paramount Chief of the Hazarajat, Lord of Kurram, personal surgeon to Maharaja Ranjit Singh of the Five Rivers, King of Afghanistan ... and many others. His highness Halan Sahib - who in 1839, enthroned on a bull elephant, raised his standard and made claim to the Hindu Kush - was known back home in Chester County, Pennsylvania, as Josiah Harlan. The man who followed Alexander the Great's winding mountain path 21 centuries later and led an army made up of Afghan Pathans, Persian Qizilibash, Hindus, Uzbeks, Tajiks, and Hazaras who were descendents of the Mongolian Hordes, a pacifist Quaker of Chester County, Pennsylvania. Whilst I've heard of the Kipling short story, The Man Who Would Be King, and the film based on it, I've never read or seen either. And to be honest, now I've read the history of the man who inspired the story, I'm not sure I want to - why would I read fiction when a true-life version is just as incredible? Josiah Harlan lived a truly extraordinary life, and perhaps the most extraordinary thing was that he had the audacity to attempt any of it. After leaving the United States with a broken heart a Whilst I've heard of the Kipling short story, The Man Who Would Be King, and the film based on it, I've never read or seen either. And to be honest, now I've read the history of the man who inspired the story, I'm not sure I want to - why would I read fiction when a true-life version is just as incredible? Josiah Harlan lived a truly extraordinary life, and perhaps the most extraordinary thing was that he had the audacity to attempt any of it. After leaving the United States with a broken heart and swearing never to return, he served as a surgeon in the British Army in India despite having no medical training. He then joined the service of an exiled Afghan monarch and slipped into Afghanistan disguised as a holy man to foment rebellion on his behalf. He then served in the court of the Sikh occupier of much of Afghanistan, eventually leaving in disgrace and lucky to keep his head attached to his shoulders. He subsequently headed the armed forces of the Afghan monarch he had originally been trying to depose, fighting against his previous Sikh master! Along the way he self-consciously modelled his path on that of Alexander the Great, crossing mountains and borders, collecting titles and honours, including the deed to a princely kingdom he visited but once. An American goes to Afghanistan with little knowledge of the local people and their customs looking to establish a political empire and bring the fruits of western civilisation. Stop me if you think you've heard this one before, but I doubt you've heard it quite like this! A fascinating read about a virtually unknown Josiah Harlan and what is, by all accounts, a life that contained enough action for at least five others. From Pennsylvania Quakers to Afghani tribes, Imperial geopolitics and the Am An American goes to Afghanistan with little knowledge of the local people and their customs looking to establish a political empire and bring the fruits of western civilisation. Stop me if you think you've heard this one before, but I doubt you've heard it quite like this! A fascinating read about a virtually unknown Josiah Harlan and what is, by all accounts, a life that contained enough action for at least five others. From Pennsylvania Quakers to Afghani tribes, Imperial geopolitics and the American Civil War - the erstwhile Prince of Ghor was somehow involved in it all. Really interesting story of All-American kook Josiah Harlan, a Pennsylvania Quaker who took a romantic jilting so bad he went to Afghanistan, where he meddled in local politics and almost got his keister handed to him on several occasions. I guess they jilted more ferociously in the 1820s or whenever it was. Today the girl would just inform Josiah via Facebook. Anyhoo, the story gets a little tedious at times. Hard to keep track of which guy named Mohammed is plotting against the other Mohammeds. Really interesting story of All-American kook Josiah Harlan, a Pennsylvania Quaker who took a romantic jilting so bad he went to Afghanistan, where he meddled in local politics and almost got his keister handed to him on several occasions. Anyhoo, the story gets a little tedious at times. Hard to keep track of which guy named Mohammed is plotting against the other Mohammeds. An intriguing bio on a man whose name should have be more recognized and revered as an explorer, adventurer in an unknown part of the world at that time. A random American guy, a Quaker from Pennsylvania managed to make his way to Afghanistan and become enmeshed with the politics, becoming a prince along the way. It's an unbelievable story, but it did happen. Ben Macintyre reveals a nugget of history forgotten by time. Josiah Harlan lived the life of an adventurer with boldness. This Quaker by birth would ironically become a General of an army and named a prince of Afghanistan. Macintyre weaves an exciting tale of life in uncharted territory, dangerous bandits and amazing people. This book is well worth reading. A true tale covering an incredible story of an astonishing man. It certainly improved my knowledge of the history of the time. Yes, quite a story, a boy's own adventure and all that. But for all that introduced me to an aspect of history that I knew nothing about before. Pros: Very interesting subject!! Thought the book was well written and researched. I really like how the author started and ended the book - with his own experience in the region and then getting into the autobiography of the first American Afghan King. Its also good to have a historical reference of this area that has had so much strife, violence yet beauty and amazing surroundings. Familiar players of the Russians, British and American intervention. Cons: Felt that I struggled a bit more with Pros: Very interesting subject!! Thought the book was well written and researched. I really like how the author started and ended the book - with his own experience in the region and then getting into the autobiography of the first American Afghan King. Its also good to have a historical reference of this area that has had so much strife, violence yet beauty and amazing surroundings. Familiar players of the Russians, British and American intervention. Cons: Felt that I struggled a bit more with this book than several others of his that I have read and enjoyed. Ben Macintyre as Joshua the great was slow read initially. This book was purchased as a present and I felt obliged to read to the end. Initially Joshua Harlan’s travels through Asia seemed complex and overly detailed. This American adventure spent the early part of the 19th century wandering around remote parts of Asia. This tale of Afghanistan from 160 years ago is very poignant with the current conflict in that region. Harlan’s adventures could not be played out in the modern world but in the t Ben Macintyre as Joshua the great was slow read initially. This book was purchased as a present and I felt obliged to read to the end. Initially Joshua Harlan’s travels through Asia seemed complex and overly detailed. This American adventure spent the early part of the 19th century wandering around remote parts of Asia. This tale of Afghanistan from 160 years ago is very poignant with the current conflict in that region. Harlan’s adventures could not be played out in the modern world but in the time of no communication and horse travel, it was an adventure to be had. Initially employed by the British East India trading company he was a maverick adventurer who was never on anyone’s side. In a time of great conflict between Britain and Russia Harlan played both sides. He became very knowledgeable in the traditions and the ways of local tribesmen in Afghanistan. Accepted at the highest level of society he was a knowledgeable spy if only he could have been recognised as an expert by the British authorities, how things could have been different. Afghanistan and the region has been a brutal place back to the time of Alexander the great. Harlan aspired to follow in the footsteps of Alexander. He traced many of his paths through Asia and met peoples who had changed little since the time of the Greek explorer. The beauty of this land and its wealth of riches is something that we don’t consider with the veil of the modern conflict. We see Afghanistan is a brutal place and not one of beauty. Harlan’s experience was so different from the news that we see today. Beautiful gardens exotic markets, and a wealth of other riches are not apparent in the modern Afghanistan. One of the most striking features of this book is how over the centuries we have failed to understand the culture and the needs of the local community. Nobody has managed to bully Afghanistan into submission for centuries how can we possibly believe that we can do it now. After Harlan’s initial visit to Kabul and his early experiences of Afghanistan he came back to the British Raja and was sent to Lahore where he became a governor for the maharaja Ranjit Singh. This Indian seek region was not part of British India and the powerful maharajah had a large international army which he used to gain control of the surrounding regions. Harlan eventually became the local governor of Gujarat. He even became the go-between between the maharajas and is previous friends in Afghanistan. Following a dispute with Ranjit Singh he left the seek community and made his way back to Afghanistan where he became the commander-in-chief of the Afghanistan army. Organising an expedition to the North West region of Afghanistan to quell uprisings by brutal warlords. On this expedition he made many friends in Hazarajat, the nation have Huzars which I thought were English horsemen, so impressed were they at the Americans ability to build up an army a document was drawn up offering Harlan the kingship in exchange for a standing army. His return to Kabul was not the joyous victory that he had presumed he would receive because while he was away on his mission the British had hatched a plan to invade Afghanistan and replace the King. Because of Harlan’s experience he expected the British to welcome him as a friend and useful person in Kabul. Instead the British confiscated all of his possessions and expelled him back to India. The British never realised that they could not just take Afghanistan by. Eventually losing over 15,000 people to the first massacre in Afghanistan and the Khyber pass. Only one person escaped with their life. The whole of this Americans adventure in Asia looks as though it could have been the inspiration from the Rajard Kiplin’s book “the man who would be King”. Josiah Harlan’s improbable life’s journey—from Pennsylvania Quaker to Afghani military leader and prince to American Civil War colonel—makes for compelling reading as crafted by Ben Macintyre in The Man Who Would Be King: The First American in Afghanistan. Harlan was likely the model for Daniel Dravot and in Rudyard Kipling’s short story of the same name, which was made into a marvelous film by John Huston in 1975, with Sean Connery as Dravot and Michael Caine as his sidekick Peachy Carnehan. But Josiah Harlan’s improbable life’s journey—from Pennsylvania Quaker to Afghani military leader and prince to American Civil War colonel—makes for compelling reading as crafted by Ben Macintyre in The Man Who Would Be King: The First American in Afghanistan. Harlan was likely the model for Daniel Dravot and in Rudyard Kipling’s short story of the same name, which was made into a marvelous film by John Huston in 1975, with Sean Connery as Dravot and Michael Caine as his sidekick Peachy Carnehan. But it also serves as an indictment of British colonialism and a cautionary tale for Western nations trying to deal with Afghanistan and its tribal currents. However, Harlan’s story is so fantastic it would never have worked as novel—not believable. A merchant seaman jilted by his fiancé in 1822, he vows never to return to the United States. He jumps ship in Calcutta and passes himself off as a doctor to British rulers there. Over the next decades he ingratiates himself with Indian and Afghani potentates, leads armies, invades distant lands, becomes fluent in various local dialects, becomes thoroughly seduced by Afghan culture, and ultimately rules as a prince of an Afghan land in the Hindu Kush. Along the way he studies the flora and fauna with scholarly interest and thoroughly enjoys himself despite brushes with death, disease and duplicitous potentates. A fascinating bit of imperial history, The Man Who Would Be King traces the true story of Josiah Harlan, a Quaker from Pennsylvania, who in the 1820s journeyed to British India to make his fortune as a military surgeon. Harlan decided he wanted more, and became a self-made player in the Great Game, using his natural talents and self-taught skills in medicine, diplomacy, and warfare, to serve the last great Oriental potentates (Shah Shujah al-Moolk, Amir Dost Mohammed Khan, Maharaja Ranjit Singh) A fascinating bit of imperial history, The Man Who Would Be King traces the true story of Josiah Harlan, a Quaker from Pennsylvania, who in the 1820s journeyed to British India to make his fortune as a military surgeon. Harlan decided he wanted more, and became a self-made player in the Great Game, using his natural talents and self-taught skills in medicine, diplomacy, and warfare, to serve the last great Oriental potentates (Shah Shujah al-Moolk, Amir Dost Mohammed Khan, Maharaja Ranjit Singh) and make his fortune. Harlan is a fascinating character: a man of great energy and ambition who climbs to power remarkably quickly, in an environment where making a mistake in your choice of friends or words can lead to painful death. Macintyre also does a great job depicting the richness of the Afghan courts and their colorful life, as contrasted against the harsh lives of the peasants. In a period when Europe and the US are spinning up an industrial revolution and basics of the modern state, the Afghans as consumed in politics and feuds from an early time; an empire collapsed into warring microstates. Harlan does become King, for barely a few weeks, climbing the ladder of Oriental nobility to rule a small valley on a putative expedition against Uzbek slavers. In the end, Harlan returned to the US, wrote a poorly received book on the British, and died in relative obscurity, but he lived a life that was heroic. Ben Macintyre makes a specialty of writing about odd, adventurous real characters, but Josiah Harlan, a Pennsylvania Quaker who wanted to walk in Alexander's footsteps and rule in Afghanistan, is the oddest adventurer of all. He worked for the British East India Company, did a tiny bit of soldiering,taught himself a few medical remedies, and then went to offer himself as a doctor or general to various shahs, maharajas and chiefs at the edges of British . A devoted botanist as well as a man of un Ben Macintyre makes a specialty of writing about odd, adventurous real characters, but Josiah Harlan, a Pennsylvania Quaker who wanted to walk in Alexander's footsteps and rule in Afghanistan, is the oddest adventurer of all. He worked for the British East India Company, did a tiny bit of soldiering,taught himself a few medical remedies, and then went to offer himself as a doctor or general to various shahs, maharajas and chiefs at the edges of British . A devoted botanist as well as a man of unbounded ambition, Harlan left extensive, perceptive journals of his journeys and the various nations and tribes he lived among. He was a mercenary, romantic and yet ready to change sides when it suited him. For eight years he governed a province under a Sikh conqueror in the Punjab, and he negotiated a treaty for his maharajah; but when the maharajah turned on him, Harlan happily went to work for his former master's greatest enemy. Josiah Harlan from Pennsylvania was the first American to enter Afghanistan, spending decades in Central Asia. During that time he was variously employed by the Maharaja of Punjab, by a former King of Afghanistan who was in exile, and by the man who drove that King from the throne. He declared himself Prince of Ghor, returned to the U.S. where he raised a regiment in the Civil War. 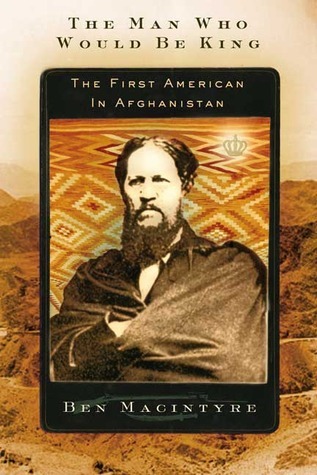 This is an amazing true story of a man who made himself an Afghan prince, but who died in San Francisco in poverty a Josiah Harlan from Pennsylvania was the first American to enter Afghanistan, spending decades in Central Asia. During that time he was variously employed by the Maharaja of Punjab, by a former King of Afghanistan who was in exile, and by the man who drove that King from the throne. He declared himself Prince of Ghor, returned to the U.S. where he raised a regiment in the Civil War. I'm always intrigued by non-fiction that is populated with figures that are far more colorful than any author could invent. Josiah Harlan began his life a Quaker and journeyed for twenty years in British occupied India and central Asia, becoming an adviser to kings and a king himself along the way. Another selling point: the author has a deliciously dry British wit that allows the hilarity of many events in this book to come to life. Read it! Not as free flowing as many of Macintyre's other books but compelling nonetheless. A perfect holiday read as you need some time to devote with each sitting. More than a biography of an adventurer, this book provides a very interesting insight into the world of India and Afghanistan in the early 19th Century. As the epilogue highlights, it also helps to put today's troubles for the West in this part of the world into distinct context. A thrilling story about the first American in Afghanistan who inspired Kipling's tale, 'The Man Who Would Be King'. This biography tells the story of Josiah Harlan's journey of manhood from a young Quaker surgeon, through the ranks of the British army, to the harsh frontiers of India, his position in the courts of the great Rajahs, leading armies over the Hindu Kush, and finally, his accomplishment of his goal to be a sovereign ruler as Prince of Ghor. The true story of an American Quaker who ends up in Afghanistan over 100 years ago. The alleged basis for the short story by Rudyard Kipling 'The Man Who Would be King' and the epic Micheal Caine/Sean Connery movie by the same title. If you are interested in the area, time period or short story I would recommend this read. Other wise I wouldnt. Written more as a scholar paper than a book. It is well researched. Its a rag to riches to.... well im not going to ruin it, story. one of the most fascinating stories I have read - all apparently true - a single Quaker American - rather stodgy and lonely - spends years in this fractionated society of Afghanistan. Helps one see why Afghanistan is virtually ungovernable - he is a 19th century Alexander - by his own account as well as this well written history. I do recommend it. Absorbing read, its a long time since I enjoyed a book so much. Gives an insight into the rivalry and political intrigue that have shaped Afghanistan's history since the 18th centuary. Not so much a country more a grouping of rival, warring fiefdoms that become united only for the purposes of opposing would be imperialist conquerors. A truly wild and bizarre story of audacious imperialism. It begs to be told, with all the right elements: exotic locale, brash and eccentric characters and the sheer weirdness of having really taken place. Pity, then that the narration is rambling and unstructured, the prose bland and uninteresting, generic in that popular-history sort of way. A waste of made-to-order raw material. Josiah Harlan should be an American legend, but instead he's almost completely forgotten. This book sheds light on his incredible life, and maintains current relevance since much of the story takes place in modern-day Afghanistan and Pakistan. Much of the rest of the players in the tale are pretty colorful. Well written piece on an interesting man and time period. Now this was one of the better books I have read in a long time. I love the Kipling story and even the film too, but this story is fascinating to me. I highly reccomend it and will read it again. Also the last place he inhabited in San Francisco practising as a doctor turns out to have been used lately as a drug store chain for decades recently and just went out of bussiness. How ironic. Ben Macintyre is a writer-at-large for The Times of London and the bestselling author of A Spy Among Friends, Double Cross, Operation Mincemeat, Agent Zigzag, and Rogue Heroes, among other books. Macintyre has also written and presented BBC documentaries of his work.